Creating Expense Items is easy in Forecast. 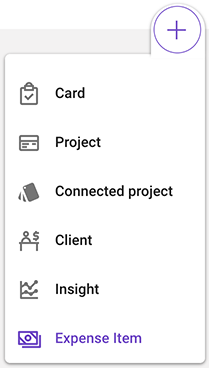 Expense items are linked to projects, not cards, and thus will only show up on the project budget. 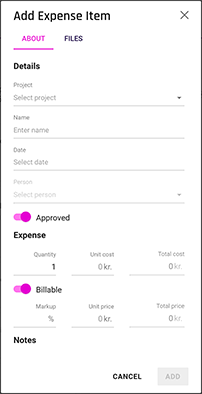 Anybody with the Permission Level of Collaborator, or above, can add a new expense item directly through the universal Create button at the top right corner. Though, expense items need to be approved by at least a Controller before it's added to the project budget. Use cases could be for a dinner you host with your client, some equipment you needed to rent, or something you purchase on behalf of your client or directly as part of the project. Conveniently, you can attach files to Expense Items, and you can easily specify the Cost, Price, and Markup of the expense. After being approved by a Controller, or above, the expense item will be added to the project budget.